Buying a sailing boat isn’t as easy as it sounds. When you are a sailing novice and a boat buying newbie, the choices can be overwhelming. 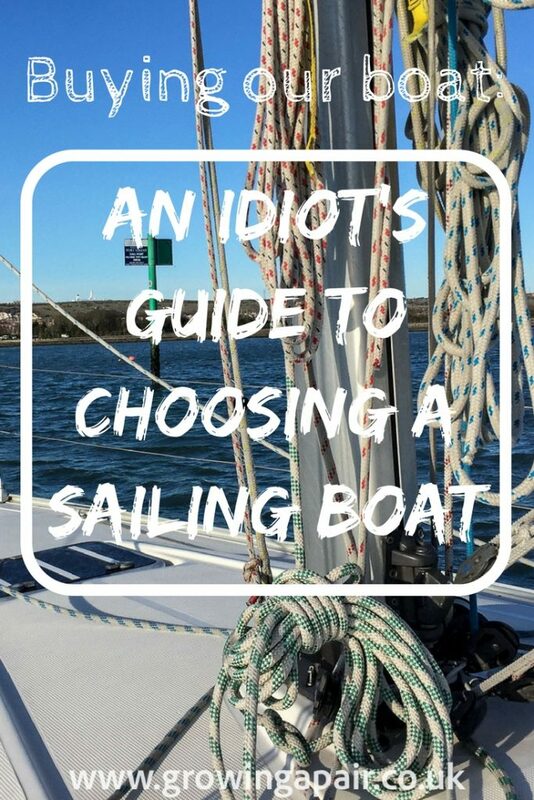 This is a quick idiot’s guide to how we narrowed down our search and bought a boat. If you’re thinking of buying a sailing yacht for a world-wide sailing adventure, read on. What type of sailing boat do WE need to buy? And so to the dilemma…. 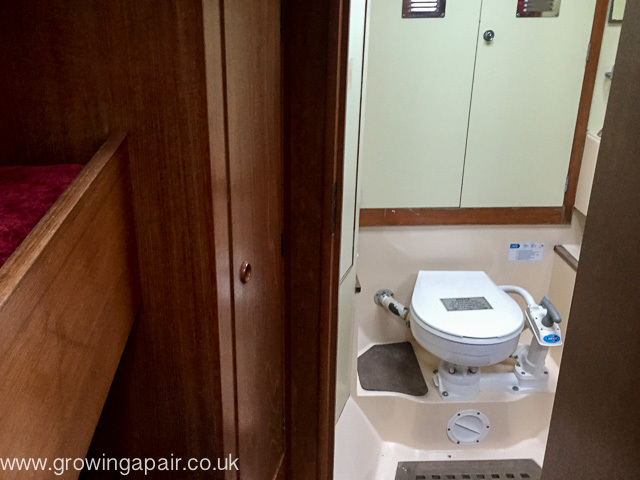 The Big Decision – Which boat did we buy? We’re buying a sailing boat. This is an important part of our ‘sailing round the world with kids’ plan. We have a couple of inflatable kayaks but I just don’t fancy circumnavigating in those. We’ll need to buy a proper offshore sailing yacht for our sailing adventure! So we started researching sailing boats…. A racer or a cruiser or a racer/cruiser or a cruiser/racer? Bluewater cruiser or coastal cruiser? A wineglass shaped hull or a flatter bottom? Aft cockpit or centre cockpit? Deck saloon or coach saloon? 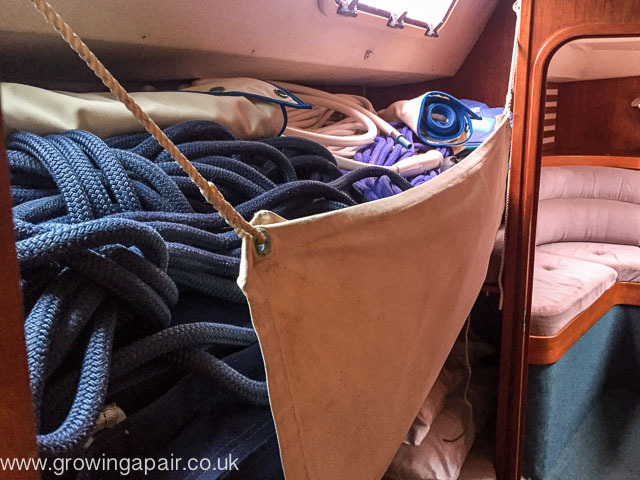 Fully battened slab reef mainsail or in-mast furling? Fin keel, wing keel or bilge keel? 35 foot, 45 foot or 50 foot? What size boat is right for you?? We set about educating ourselves. We have been reading and researching for months. We’ve asked many, many boat buying questions of many boaty people. We have asked questions on boat forums and Facebook groups. We have spent ages trawling through specifications on yachtworld.com and boats.com. Choosing a boat is very time consuming when you’re a newbie. Not only do you have loads of different types of boats to learn about, but you also have to learn a whole new language! The boys won’t fit in these passage bunks. It’s important to narrow down your options right at the start. Compromise is all-important when it comes to selecting the right sailing boat. For us, I think it’s pretty unlikely that we’ll find any boat in our price range that exactly meets all of our requirements, but we want to buy a sailing boat that’s right for us and for the type of sailing that we hope to do. We’ll have to be flexible and keep an open mind if we want to find a safe and comfortable offshore sailboat that suits us – a family of four from the UK, with two more-or-less teenage boys, who plan to sail across the Atlantic and, hopefully, sail around the world. Our sailing boat will need all the things a home should have – beds (bunks), a functioning kitchen (galley), toilets (heads), a comfortable living and dining space (saloon), enough storage for our stuff, heating or maybe air conditioning, and entertainment and tech gadgets (this isn’t the time of Christopher Columbus after all). And that’s another problem – sailing involves learning another language. I still don’t know what ‘splice the main brace’ means. Anyone?? Sam is 12 years old and as tall as me. Evan isn’t far behind him. As they approach their grumpy, unreasonable teenage years, they will need their own space. Also, with two smelly, hormone-ridden boys on a sailing boat with limited washing facilities…. I’ll need my own space too. Despite the boys being almost the size of adults, they are actually still children. I’m sure they will be very useful crew members (they are fully qualified RYA Competent Crew) but we have to presume they won’t be. So we need to buy a sailing boat that can easily be handled by two people, with modern navigation equipment and all lines leading back to the cockpit, at the very least. I don’t want to buy a sailing yacht that we can’t sail without hiring crew! Who knew this question could be so contentious? It turns out that there are many strong opinions about what makes a good bluewater cruiser, from all sides of the boaty community. As one forum member informed me, “Opinions are like arseholes. Everybody has one”. And she’s definitely right there! I’ve been told many times that there is no such thing as the perfect boat and every boat has it’s compromises. But enquire as to whether a particular make of production-made sailing boat is a bluewater boat suitable for offshore sailing and crossing oceans and all hell breaks loose. Calm down, people! Yes, yes, I know! All boats are a constant repair project. Cruising the world on a sailing boat is often described as “boat repair in exotic places”. But surely a boat built in 1983 is going to break more often than a boat built in 2002? Isn’t it?? Well, yes, probably. Unless the boat has been meticulously maintained and loved and had constant money spent on it, then lots of parts will be old. On a thirty year old boat, lots of things will be thirty years old and some of them will be nearing the end of their life span. However, a thirty year old GRP boat will likely have a thicker hull and may be better built. We have been told many times that in the era of computer aided design and budget cuts, GRP hulls got thinner and thinner almost to the point of being too thin. In any budget, you’ll get more ‘old boat’ than you will ‘new boat’, but would ‘old boat’ be better? Our budget has had to change since we started the boat buying process. Needless to say, the budget hasn’t gone in a downward direction. Buying a sailing yacht is never going to be cheap. Whatever your budget, keep a hefty chunk of cash aside for all the unexpected expense after you’ve bought the boat. The obligatory ‘pump as you dump’ marine toilet. What’s not to love? How do we make sure we buy the right type of sailing boat for us? Older, heavier boats with a narrower wine glass shaped hull cut through big waves but don’t generally have a lot of space inside. Some of the older boats that we have looked at reminded us of dark, dingy old man pubs with dark wood, low ceilings and yellowing head linings. Now, I love an evening at our local dark and dingy pub, but I wouldn’t want to live in it. The newer production-made boats make the most of the internal space and feel like modern apartments inside, but have flatter bottoms and are lighter, making them much less comfortable in heavy seas. They also tend to have much thinner hulls as they have been designed to within an inch of their lives by computers. Our knowledgable boat builder friend descried them as ‘bendy toys’. When asking the ‘safety in big seas’ question, I’ve been told many times that the modern production boats are quite capable of crossing oceans but if caught in a storm they would much rather be in a heavy, bluewater cruiser. Even yacht brokers trying to sell me said ‘bendy toys’ have told me this. To add to the dilemma, some say modern boats may have thinner hulls but are made with more modern techniques and have more modern hull designs. OK, so trying out boats hasn’t been all bad. 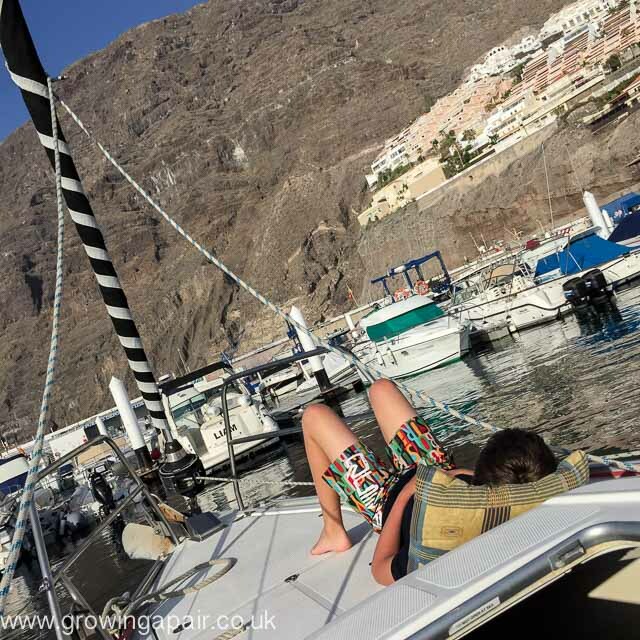 We introduced the boys to sailing and did some training in the Canary Islands on a Hanse 400. It soon became apparent that a boat of the size we want and the age we want, with the internal space we want and with the ability to safely cross oceans…… doesn’t actually exist. Well, it does. But not within our budget. There really is no such thing as the perfect boat for our family sailing adventure. At least not without a substantial lottery win. Something has to give. There has to be a compromise. We can have size and bluewater capability, but it has to be off of the 1980s with limited living space and a resemblance to the Black Hole of Calcutta. Or we can have size and space and a much newer and more modern boat, but we might all die in the middle of the Pacific. It’s a toughie! Boat research in the UK – not quite so glamorous. We keep going round and round in circles. We haven’t even mentioned the monohull/multihull argument. Or the option of buying a cheap project boat and making it your own. Or the option of buying a sailing boat in another country, like the US, where there is a lot more choice than here in the UK. To add to the rational, sensible, well thought out and researched arguments between the different types of boats, we have the issue that I just can’t bring myself to buy a boat that I don’t love. 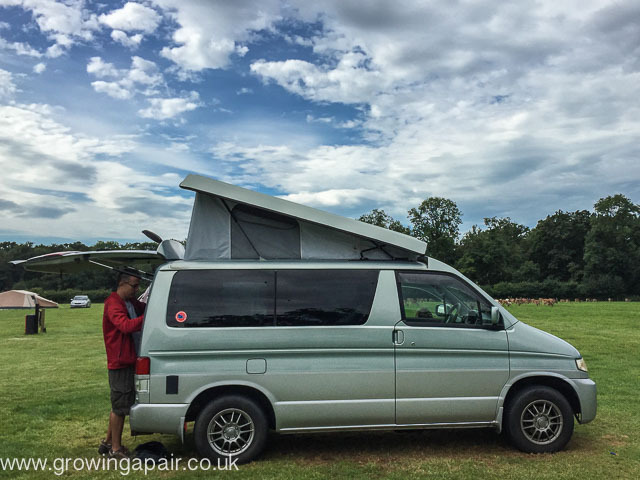 We have a 17 year old Mazda Bongo campervan called Bogey. Bogey isn’t really suitable as a campervan for a family of four. He’s too small, very slow, very cramped and drinks so much fuel that you can almost see the fuel gauge dropping as you drive. And he smells a bit. But we love him, so it doesn’t matter. I want to buy a boat that we love as much as Bogey. Bogey – he’s not perfect but we love him. “There’s no such thing as bluewater boats, only bluewater sailors”. I think by now you can see our problem. I think the key to choosing the right sailboat for your family is to figure out what your requirements are. Narrow down your search. View loads of boats. Sail different boats. If possible, spend a night on different boats. And be patient. Don’t rush into anything but also don’t take too long about it. I’m pretty sure you could spend years searching for the perfect boat and I don’t think it exists. For those of you who know about these things, we have looked at Bavarias, Hanses, Westerlys, Moodys, Beneteaus, Hunters and Oysters. We’ve looked at boats from 39’ to 46’ (that’s about 12 metres to 14 metres). The oldest boat we have viewed was built in 1983 and the newest in 2004. 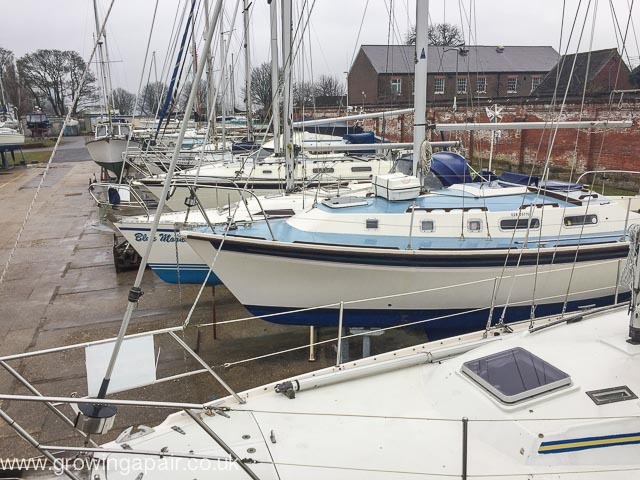 And finally, after months of researching, learning and searching, after hours of obsessively sifting through yachtworld.com, after sailing on different boats and viewing loads more….. we have found our sailing boat! She’s an Oyster 435. Cutter rigged. Built in the UK in 1990. We have paid a deposit and now we’re waiting for the results of the survey. Fingers crossed that it’s not a shed. Of course, this is just a brief wander through the thought-processes of a peri-menopausal mum trying to buy a very specific boat for a very specific purpose. We are boat buying numpties so don’t take our word for it. There are some pretty good books about how to buy a boat. Most are available as a Kindle Edition. If you’re completely new to this, like us, ‘The Ultimate Guide to Buying a Boat‘ will walk you through the basics of buying a boat from the decision to the survey to closing the deal. I wish I’d read this a bit earlier, to be honest. It’s a Kindle edition so you can just download it to your phone. And it doesn’t cost much. ‘How NOT to Buy a Cruising Boat‘ is an honest and entertaining look at the boat buying process and how it can go wrong. Highly recommended. And while you’re at it, if you are thinking of jumping on a boat indefinitely with your kids and going on a family sailing adventure, get ‘Voyaging with Kids‘. It’s fab. Is there a country where they cost less than others in general? A better place to buy, lower prices, less taxs, lex fies etc.? I don’t think there is a ‘cheapest’ country. From our (limited) boat buying experience, it seems that there are pros and cons to buying close to home or buying abroad. We are in the UK. We searched for boats in Europe and boats in the US, by trawling through yachtworld.com. The taxes to import the boat into the UK and the cost of getting it back here put us off. But that is because we want to sail in the UK for a couple of seasons. it depends on your needs. I think if you are willing to start your sailing adventure from the country you are buying from, then that would work. I have heard that you can get bargains in the Caribbean where people have fully kitted up their sailing boats for cruising and then realised that it’s not the life for them. And there are always lots of cheaper ex-charter boats in Croatia and Greece at the end of the season. USA, but then tax is not paid and it might need some work. UK, Italy, France, Spain & Netherlands have some good ones but have the patience to shop around for a while. I’ve been saying that I’ve never had to work so hard to spend money. We’ve been trying to buy a boat since February. Flew down to Florida a couple times and have spent a TON of hours driving around locally (another 3 hour trip each way?) to look at different boats. A week from today we will be surveying a second boat – first one failed. But, we aren’t as excited as we thought we’d be. I mean we are a little bit. So many months, so many disappointments. I think we just don’t want to get our hopes up again. No one told us this is was what could happen or how hard it would be – just pure exhaustion. It’s got to be better on the other side, right?